THEODORE ARTHUR BUENGER, a professor of archaeology in later years, discussed the myth of Talos in his Ph.D. thesis on the depiction of Crete in Greek mythology. Talos, of the race of bronze, "last of the race of men sprung from ash-trees," or a brother of Minos and Rhadamanthys, or a son of Minos, or of Oenopion of Chios, or son of Cres and father of Hephaestus, or made by Hephaestus, given by Zeus to Europa, or by Hephaestus to Minos, also called Taurus, was entirely of bronze with the exception of a single vein running from his neck to his foot, or only along his heel. This vein was closed by a thin membrane, or a bronze nail. His life depended on the blood remaining in this vein. 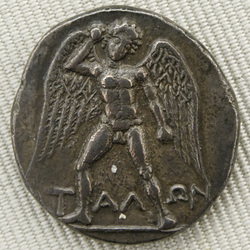 Talos was the guardian of Crete, who made the round of the island thrice daily. Plato, rationalizing, makes him a judge whose circuit took him over the whole of the island three times a year; it was his duty to see to it that the laws engraved on bronze tablets were kept. It is said that originally he lived in Sardinia, where he killed many of the natives. He seems to have kept his dislike of this people even in Crete, for when some of them landed there, and refused to go to Minos, he took them and pressed them to his breast, then leaped into a fire. The fire naturally would not harm the bronze Talos, while the victims would be killed by it. During this procedure he would laugh "sardonically," i.e., in a Sardinian way, or the features of the men he held would be distorted in their death agony so as to show a "sardonic" grin. Talos tried to prevent the Argonauts from landing in Crete, but Medea killed him by opening in some way or other the vein in his foot. According to another version Poeas shot into his heel and tapped the vital artery. It is tempting to think that the Talos myths are the last memories lingering among the Greeks of the worship of Baal-Moloch. The stories agree rather well with the accounts of sacrifices to this divinity: the victims were killed by the heated metal statue of the god. Source: Theodore Arthur Buenger, Crete in the Greek Tradition, Ph.D. thesis, University of Pennsylvania, 1915, 35-36. LEWIS RICHARD FARNELL (1856-1934) was a classical scholar at Oxford University. In his Cults of the Greek States (1896), he argued that Talos (Talus) was derived from the Phoenician god Moloch, something later research would prove chronologically impossible. Nevertheless, his intuition that the Talos myth has pre-Greek and Near Eastern influences would later prove to be correct, just not with the specific Near Eastern peoples he assumed. The darker aspect of the worship [of Cronos], the practice of human sacrifice, is scarcely attested by any trustworthy record concerning any Greek community except Rhodes; but is an inference legitimately drawn from legend and from indirect evidence. The Greek authors of the earlier period who mention it regard it as a barbaric institution; but if there were no ancient tradition connecting it with the Hellenic or Hellenized god, it would be impossible to explain why he should be so constantly identified with a Semitic and Celtic god to whom the cruel sacrifice was paid. And we have a detailed account given by Plutarch and Diodorus of the Carthaginian offering of children to Moloch, who was often regarded as Cronos. The bronze idol stood with his arms extended and his hands sloping downwards, so that the infant placed upon them slipped off and fell into a pit full of fire that was placed beneath, and its wails were drowned with the noise of drums. This ghastly rite certainly travelled to Crete, where the myth of the brazen giant, Talus, who clasped strangers to his breast and sprang with them into a pit of fire, attests the worship of the Semitic god. Source: Lewis Richard Farnell, The Cults of the Greek States, vol. 1 (Oxford: Clarendon Press, 1896), 28-29.